Hey guys, a few months ago I got the Kat Von D Alchemist palette. It's been super popular since the launch & has been out of stock forever, so today I'm gonna share some other highlighters that may peek your interest. Last December I posted my review on the Alchemist palette, because I really wanted to share how much I love it. I'm a huge addict of the whole fun highlighter trend. It is by far the best trend ever. The alchemist palette contains 4 shades that can be used not only as a highlighter but as eyeshadows as well. Below are side by side swatches of the ones I thought would be similar to each other. Although as You can see I do feel KVD Amethyst is more similar to Colour Pops Honeymoon. First we have Kat Von D's Amethyst & Colour Pop's Hippo. Unfortunately they're not the same, Amethyst is a bright light purple, & Hippo is a more of a pinky purple. The second one we're gonna look at is actually a dupe, it's the Kat Von D's Opal & Colour Pop's Monster. The pigments used are the same however the formula is different. 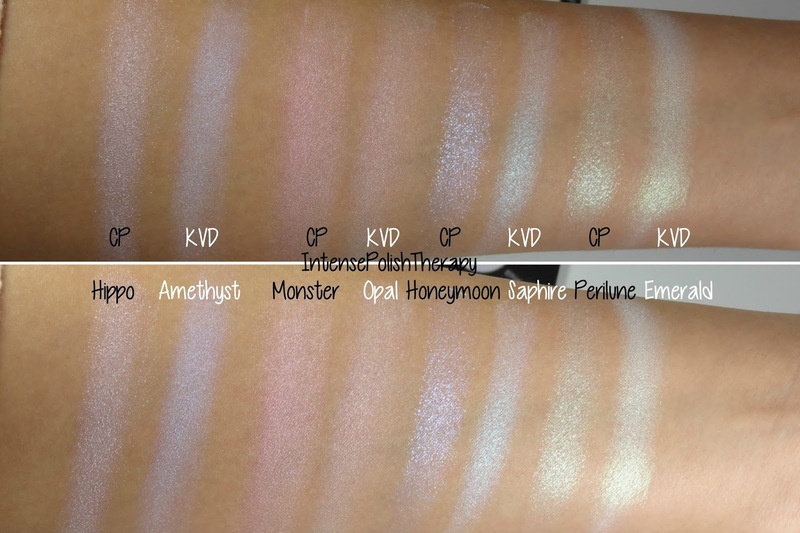 Since the KVD one is a powder, it has a bit more of a white shadow, compared to Colour Pop formula which is more of a cream that doesn't have that chalkiness. 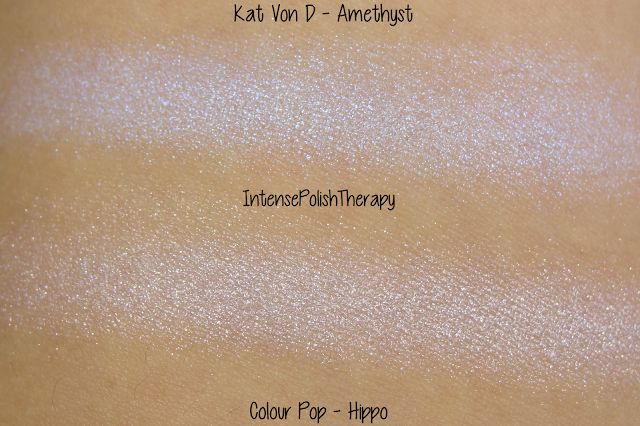 Up next is the Kat Von D's Saphyre compared to the Colour Pop Honeymoon. Saphyre is more of a bright aqua shade. & Honeymoon is more of a fine glittery purple without the thick texture of glitter. They're not really similar at all, Honeymoon looks more like Amethyst. Lastly is Kat Von D's Emerald compared to Colour Pop's Perilune. This one is actually almost a dupe however Perilune is more of a bigger particle shimmer. However the shades are extremely similar. The Kat Von D palette retails for $32.00 USD ($44.00 CAD), you can find this palette on the Kat Von D beauty website or on the Sephora website. The Colour Pop highlighters are $8.00 each on the ColourPop website. I hope you enjoy this post! Take care!